You are here: Home / Jewelry / Glorious convertible antique diamond necklace. Glorious convertible antique diamond necklace. You know I love glamorous, elaborate pieces as much as the next lady, but sometimes a completely simple piece can pack just as much of a punch. 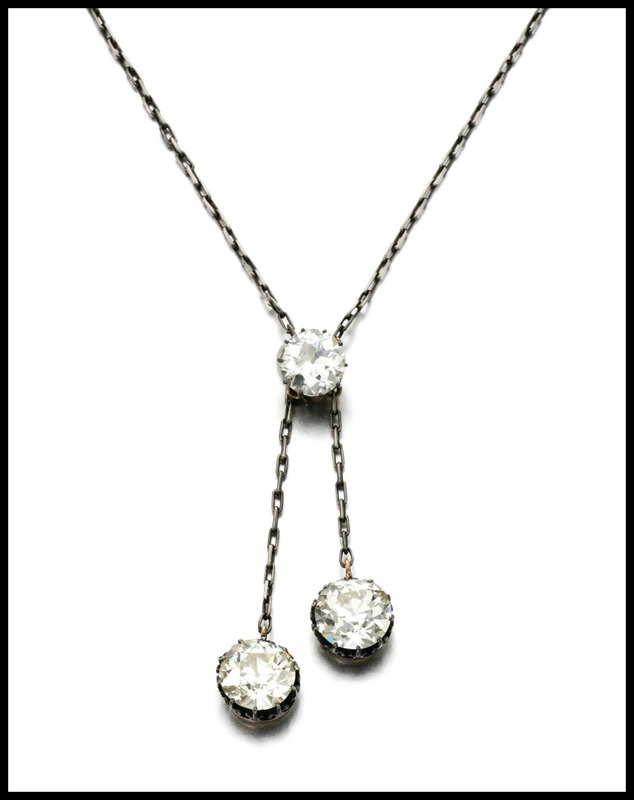 For example: this convertible antique diamond necklace. This elegant beauty dates to 1890. The three glorious circular-cut diamonds weigh 3.22, 5.23 and 5.55 carats respectively and – are you ready for the best part??? – they’re detachable. They detach because they can also be worn as a pair of earrings and a ring with alternate fittings. Sigh. Just look at those luscious, juicy, luminous wonderful diamonds. There’s nothing in the world like antique diamonds, and the simple fine-link chain is the perfect compliment to them. I wonder if the earring fittings are for studs or drop earrings? The auction listing only shows this piece in necklace form, sadly. I’m sure they’d be amazing in any format, but I’d love to know everything about this fabulous piece. How many of you are swooning over this with me? I know there are some other antique diamond lovers out there too. 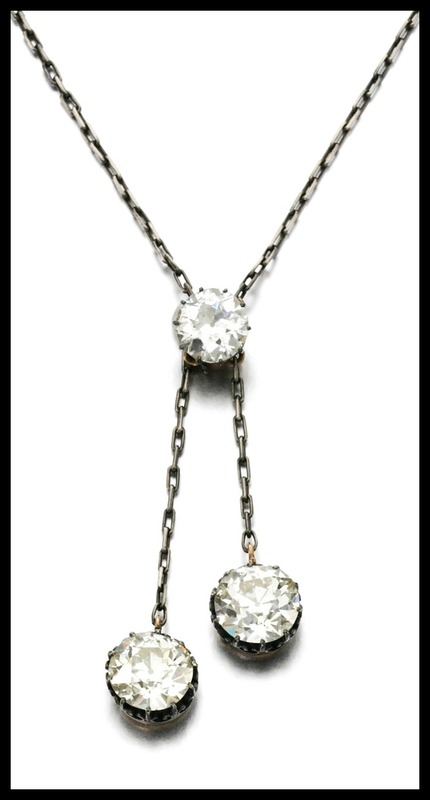 This fantastic convertible antique diamond necklace was listed in a recent Sotheby’s auction. All images and info are thanks to Sotheby’s. That’s actually incredible! Never seen anything so stunning and unique before- I love that they are detachable earrings! Just Glorious!! I love these ‘negligee’ type necklaces, but most of them are too ‘frilly’ for my style (even tho I think they’re beautiful). This one is divine! and I love that it’s convertible to other jewelry. I am so swooning with you, really. Elegance, simplicity and utility in one – can you ask for more?